In her latest book, Ella shares the most in-demand recipes from her delis and reflects on her journey from food blogger to bestselling author and entrepreneur. Ella Woodward is the author of must-read food blog www.deliciouslyella.com. She has created a hugely successful app to accompany the blog, opened her own deli in central London and launched her own line of energy balls. 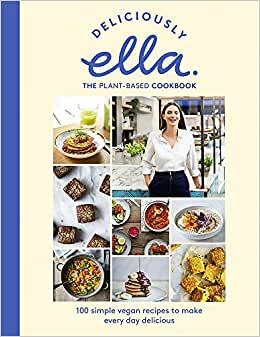 Ella's debut book Deliciously Ella was a number 1 bestseller when it was first published in January 2015, becoming the fastest selling debut cookery book since records began. It was also named as Amazon's biggest selling book of 2015. She was awarded a prestigious Observer Food Monthly award for Best Food Blog 2015. Her follow-up book, Deliciously Ella Every Day has been another hit bestseller. 5.0 out of 5 starsDelicious is Spot On! Fantastic book! I have cooked-baked most of them already and they are fantastic! The "substitute" suggestions are so handy: if you don't have in your cupboard or allergies. I waited until the American release date to get a copy with cups and lbs. ..... what I received was grams and liters. So sad. Just mentioning that this kindle release is the British version. I was eager to see the recipes so ordered this ahead of the release date for the US version of the book. I might still order the color hardcover book when it comes out since cookbooks seem better in color. I admit that indirect inspiration from my current job influenced me to obtain this kindlebook that is Deliciously Ella; The Plant Based Cookbook; 100 Simple Vegan Recipes To Make Everyday Delicious by Ella Mills Woodward. I admit that I am far from being a vegan or even any kind of vegetarian which puts me in a category different from this kindlebook’s intended audience. However, I found the author’s (Ella Mills (Woodward) story heartwarming in terms of why she got more into eating a plant based diet and other details that include how she met husband. Recipes that are included in this kindlebook; creamy cauliflower and chickpea salad, rainbow salad, spiced peanut sweet potatoes, olive and sun dried tomato quinoa, sweet potato cakes and more. 5.0 out of 5 starsBest plant based cook book ever! Obsessed with this cook book. It's beautiful and so easy to follow. The only downside is that it doesn't give you the cooking time? In general, love it, the dishes are so tasty you wouldn't even realize you are eating vegan. Would definitely recommend and is a very good starter to vegan diet because the dishes are not too extreme, a lot of them are actually quite heavy! Her best yet. Love the personal journals that are included. I my never eat at her restaurant but can now enjoy the recipes. Thank You!